Welcome to PetSmart’s salons – where opportunity is always in vogue. While you work to keep pets looking great, we’ll help you to grow your career, build a book of business, and achieve your ambitions. This means that your future will look every bit as good as the pets you pamper. Discover how you can work in an exciting environment with people who share your passion for pets and keep our furry friends clean, happy and looking fabulous. Groomer Trainee – Over several months, you’ll gain experience shampooing and caring for our furry clients. PetSmart Grooming Academy – We offer free, paid training in our Grooming Academy which includes a paid apprenticeship with instruction valued at $6,000. Salon Field Practice – Bring your Academy training to our salons. Under the mentorship of an experienced pet stylist, you’ll get hands on experience grooming all breeds of dogs. There are a lot of great reasons to choose a career grooming pets, but it can be difficult to strike out on your own. The constant hunt for leads, self-employment taxes and health insurance worries are enough to drive you barking mad. That’s why joining PetSmart as a Pet Stylist is a great decision for so many. We understand your need for independence, but we support you with stability and a great brand that helps drive new clients straight to you. The rewards of a PetSmart career are pretty good looking too. I was trained for success and I took it and ran with it. I started as a Bather and I am now a District Academy Trainer. The ability to grow and develop yourself in this company is unreal. We take pride in picture-perfect pups and our PetSmart Grooming Team. They turn grooming into an art at competitions across the nation. Every year they win trophies and awards while representing the top-quality work PetSmart stylists are capable of. 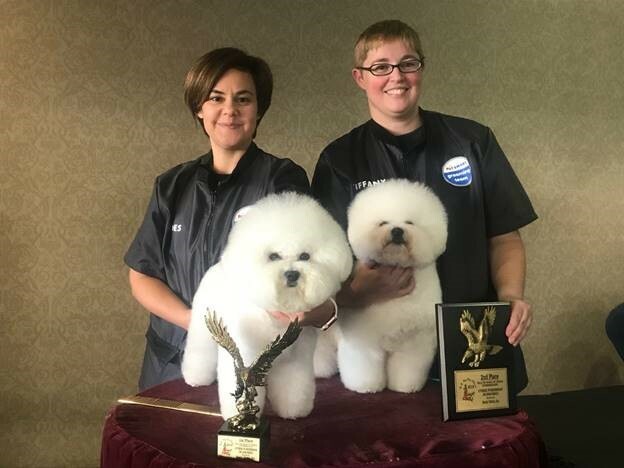 With this kind of talent on display, it’s no wonder that the average tenure for the PetSmart Grooming Team is 12 years! See our team’s 2018 achievements below and check out what the whole team is up to on Twitter.